Dethklok, Machine Head, All That Remains and The Black Dahlia Murder will embark on a 31-date North American tour this fall. The following is Machine Head’s press release, and below that are the dates. Machine Head will spend the next few months on the road, doing what they do best and that’s lay waste to stages across the U.S., reducing them to piles of rubble and ash. In advance of the tour, in mid-September, “Darkness Within,” one of band’s most powerful offerings, will ship to Rock radio. The video for the track can be viewed HERE. 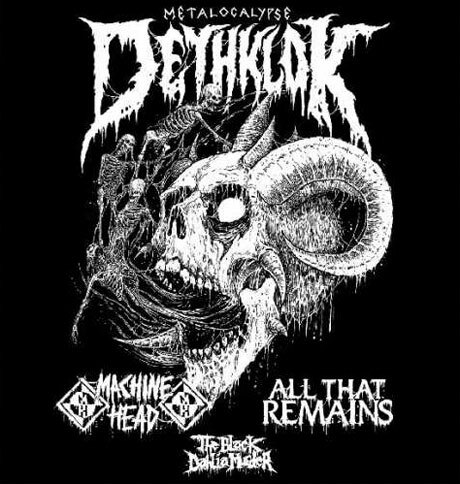 The Bay Area metal titans will embark on what is sure to be one of the “must see” tours of the fall season with Dethklok, All That Remains and Black Dahlia Murder. That lineup translates into one helluva night for metalheads. The trek kicks off on October 24th with a “warm up show” in Louisville, Kentucky, 2 massive radio festivals in Orlando and Tampa Florida, and then begins with Dethklok on Oct 30th at The Norva in Norfolk, Virginia and will hit 33 cities before wrapping on December 8th in Atlanta, Georgia. This tour will also be offering a limited number of Machine Head VIP Meet and Greet packages, look for updates and links coming later this week.